Aer Lingus has cancelled more than 50 flights from Dublin Airport today as weather continues to wreak havoc with schedules. The airline had planned for a return to full operations after suspending all flights yesterday, but updated the situation last night. 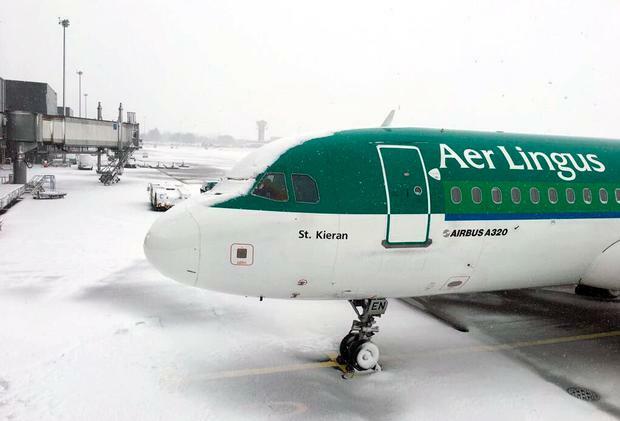 "Our Dublin short-haul flight schedule on Saturday will be disrupted with early morning flights cancelled and most operations not commencing until after 10am," it says. Ryanair has also cancelled over a dozen flights to and from Dublin tomorrow. Affected passengers will be informed by SMS and email, but anyone flying should check the status of their service before leaving for the airport. A mammoth transport operation will get into gear today at airports and ports in a bid to get thousands of Storm Emma-stranded passengers home. Despite the cancellations, Dublin and Cork airports hope weather conditions will permit them to get thousands of stranded passengers to their final destinations. Shannon and Knock airports will operate a full schedule from 5am. Thousands of Irish passengers stranded overseas since Wednesday are also hoping to make it home as carriers across Europe attempt to deal with the snow-created backlog. Passengers have been warned to expect delays as carriers work to deal with three days of cancelled flights. Aviation officials warned that Irish airport departures will be dependent on weather conditions in arrival destinations. It is hoped ferry services affected by Storm Emma will recommence today.